In November, the European Commission presented a new climate initiative that paves the road for a carbon-free Europe by 2050. The Commission clearly specifies in the initiative that one element stands out as being of primary importance for reducing Europe's CO₂ footprint - electrification. Kristian Ruby, Eurelectric, Thomas Egebo, Energinet, and Morten Helveg Petersen, EP, share with us their perspectives on the announcement. This is the ambition of the EU Commission's climate initiative from November 2018. The last time the Commission announced such a long-term goal was in 2011. Back then, the aim was to reduce emissions by 80 per cent by midway through this century. But now the bar has been raised. The vital ingredient of this recipe for success is electrification. That means an increasing amount of our energy consumption must come from electricity. And even more of this electricity must be produced by renewable energy. Today, renewable energy comprises 30 per cent of our electricity production. The Commission's ambition is for this to reach 80 per cent by 2050, with offshore wind power comprising half of that figure. Here, Kristian Ruby, Secretary General of Eurelectric, Thomas Egebo, CEO at Energinet, and Morten Helveg Petersen, Member of the European Parliament, share their perspectives on the announcement and not least what it will take to achieve the ambitions. Kristian Ruby, Thomas Egebo og Morten Helveg Petersen. What changes in our society will be required for us to realise the potential of electrification? "Looking ahead towards the middle of the century, half of all the energy used must be carbon-neutral electricity. It is therefore vital that we work on strengthening demand for electricity in other sectors. It's a matter of electrifying more sectors but also ensuring flexibility so we can store electricity, for example, in the batteries in electric cars when it's blowing a gale in the North Sea. As renewable energy is a more variable energy form, we must make sure that the demand side is flexible so that society doesn't stop in its tracks." Is this ambition even realistic? "We must approach this like a Tour de France – can you complete that in one day? No. But if we are a determined team and focus on our strengths, we can do it. Here, Denmark has the track record to lead the pack. There is plenty of Danish experience of expanding the offshore wind sector and integrating renewable energy in the electricity grid that can inspire the development that Europe is facing. The countries in Europe have diverse starting points for seizing opportunities. Also, some countries face greater investments than others. This is where the Danish case can provide inspiration, and I am already experiencing great interest in the systematic Danish approach to energy efficiency and renewable energy." Today, renewable energy accounts for 30 per cent of our electricity production. The Commission's ambition is for this to reach 80 per cent by 2050. How will we achieve that goal? "Offshore wind power is a crucial part of the answer. If we want this transition and a climate-neutral society, it will require an expansion that is unfeasible on shore. There are not the same limitations offshore as there are onshore. This is one of the reasons the North Sea contains such huge potential. It also means we must hit the ground running and start expanding in the field of renewable energy. The expansion we need is gigantic, and it must happen now." "If we are to exploit the potential of electrification, we must succeed in using electricity for far more things than we do today. This could involve transport, or electricity for heating e.g. via heat pumps. The benefit of the new applications for green power is that the technologies are energy efficient. So if electricity consumption increases, it does not mean more energy is consumed. It is also important that we develop new technology that can help us to convert electricity into alternative forms of energy. Electricity can be converted into a wide range of different materials and energy forms, such as hydrogen, synthetic plastics etc. I hope that in the future we will see energy plants that ensure energy in various forms flows freely between different sectors to a much larger extent than today. We call the latter 'cross-sectoral connections', and I think we should do far more to strengthen them." Today, renewable energy comprises 30 per cent of our electricity production. The Commission's ambition is for this to reach 80 per cent by 2050. How will we achieve that goal? "The Commission's initiative IS ambitious, so our initiatives must match that. At Energinet, we are currently working with Dutch TenneT on exploring the opportunities for energy islands in the North Sea. It's a matter of combining power from offshore wind farms with interconnectors (cables, ed), so the power can flow where it is needed. Today, there is 11 GW of offshore wind power in the North Sea countries. 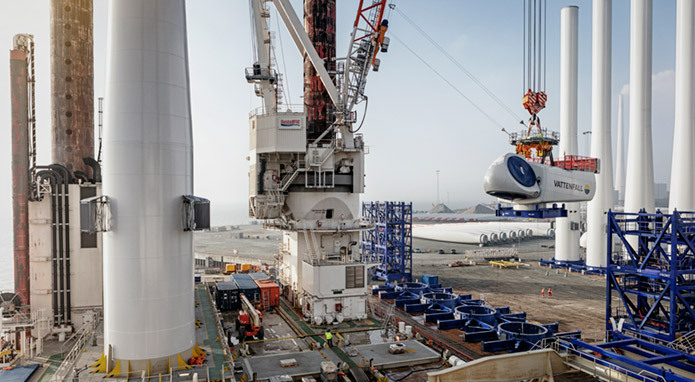 With energy islands in the North Sea, reaching up to 75-200 GW is possible. In the future, nationwide power production will be a thing of the past as production will be on a European scale. Here in Denmark, we have fantastic opportunities for producing energy in the North Sea. In fact, the very best areas are off the west coast of Jutland. The potential is great and much more greater than our own requirements here in Denmark. Consequently, a strong internal market for energy in Europe is another important precondition." What demands will this development make on our electricity grid? "I am not concerned about whether the large amount of new green power can be integrated in the electricity grid in the short term. However, if we scale up our exploitation of the wind in the North Sea, we will face some challenges in terms of our infrastructure. At this point, we must consider whether there are any smarter solutions than those we have been using up to now. For example, when transporting energy a long way, it is easier to use gas pipelines rather than powerlines. Another focal point for the infrastructure of the future is to create intelligent demand and consumption. Demand must be linked to flexibility so we automate our consumption depending on the level of pressure on the system. This will, for example, mean that electric cars recharge during peak capacity when the power is cheapest. If we can make the consumption intelligent in this way, we will be much more flexible and efficient. Digitisation is crucial for this to be possible. We have a wide range of data that we must make an effort to bring into play to make solutions smarter." Do you agree with the core ingredient of the Commission's initiative – that electrification will play a major role? "Yes! Because renewable energy is the key to completely carbon-free electricity as early as the coming decade. And as we are increasing the share of renewable energy, of course we must electrify the heating, cooling and transport sectors. On all three parameters, we currently depend far too much on fossil fuels. In Denmark, particularly within transport, we unfortunately have a long way to go in relation to rolling out electric cars." "We must understand that battling climate change is a question of life or death. A new kind of commitment is therefore essential – we need action and investments, both politically and economically. In other words, an extensive political task that involves creating a well-functioning internal market for trade with the energy that long term will be produced in the North Sea. It must be possible to sell the energy freely on the continent. Before Christmas, I negotiated a reform of the EU’s electricity market that will force national authorities to open up a minimum of 70 per cent to electricity from the neighbouring country. It was a large step forward even though of course I was pushing for 100 per cent. And it also involves raising our green ambitions while tightening up in relation to governments in EU countries that do not meet their obligations. If it was up to me, countries would not get EU support unless they take action in the climate area. This would apply in particular to fulfilling the goals for renewable energy, which require an offensive agenda at both national and European levels." What role does the European collaboration play in this area? "European and international collaboration in particular is the key to solving future climate challenges and realising the potential of electrification. It is so important that we prioritise the climate and energy negotiations at EU level. Denmark only accounts for 2 per cent of the EU’s total economy. It is therefore useless to focus on national initiatives like the energy settlement from the summer of 2018. We must work on European energy and climate policies if we are to make serious progress and solve the climate crisis."